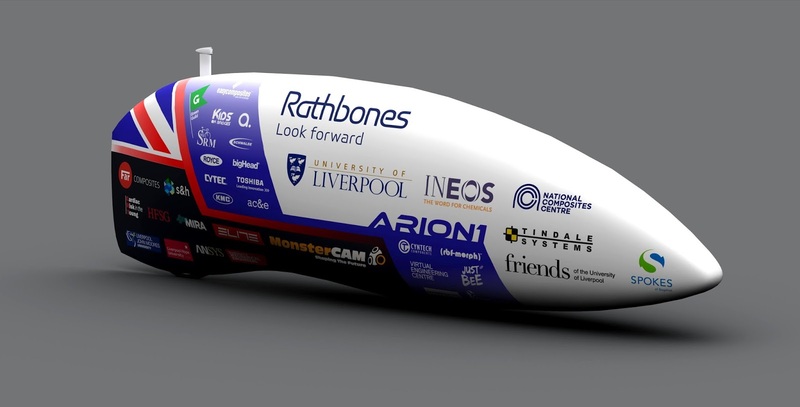 University of Liverpool Velocipede Team raised money for their attempt to break the WHPSC (World Human Powered Speed Challenge) record at Battle Mountain in September 2015 by selling t-shirts. Oh yeah...looking good in my ARION 1 T-Shirt. 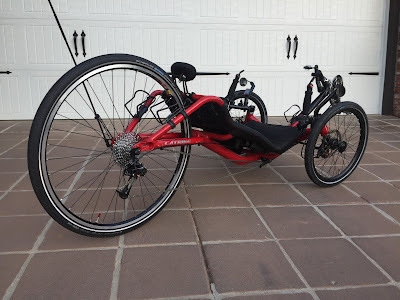 As I prepare to get my "Red" Catrike 700 ready for sale, I can say that I've learned a lot from having two Catrike 700s. The "Black" 700 is my light and fast ride and the "Red" was set up for casual cruising and possible touring. 1 - I don't need two 700s. Everything I can do with two 700s I can do with only one. 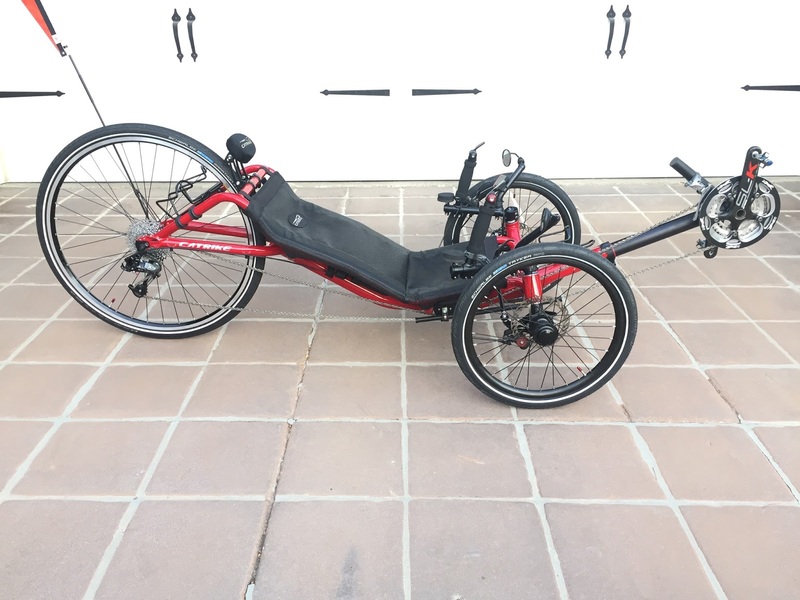 2 - With a little bit of planning and hardware selection I can change the setup on one 700 within minutes and be ready to ride with different configurations just about anytime at any place. 3 - Going with a wider tire on the rear wheel has a more positive effect on comfort with less loss in speed then going wider on the front wheels. Also going wider on the rear tire has minimal to no effect on handling where going wider on the front tires definitely effects handling. 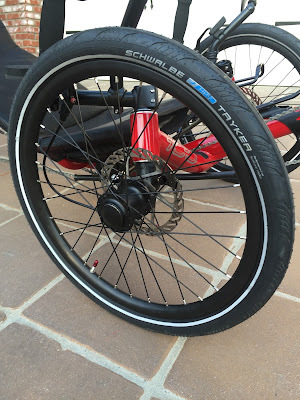 4 - I do not like Schwalbe Marathon Plus tires, I do not. They are heavy, slow and a bear to put on and take off. To be able to easily change the configuration on my 700 a tire is required that is easy to remove and replace. I would rather have an occasional flat (only two this year) then mess around with these energy absorbing monsters. 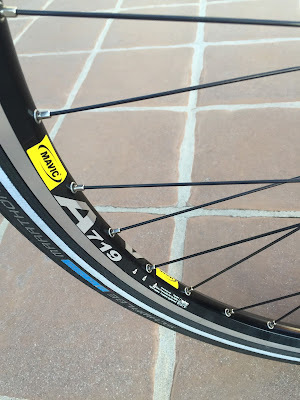 5 - Having two wheelsets is a luxury more then a necessity. But it allows me to have a super light wheelset option (the American Classic Aero) that would otherwise not be suited for larger tires and loads. It is also nice to be able to have two wheelsets ready to go with my most used tires already installed, the Schwalbe One 23/622 and the Schwalbe Kojak 35/622. 6 - With good tire selection (I like folded bead tires for ease of installation, lightness and storage) tires are easy to change. 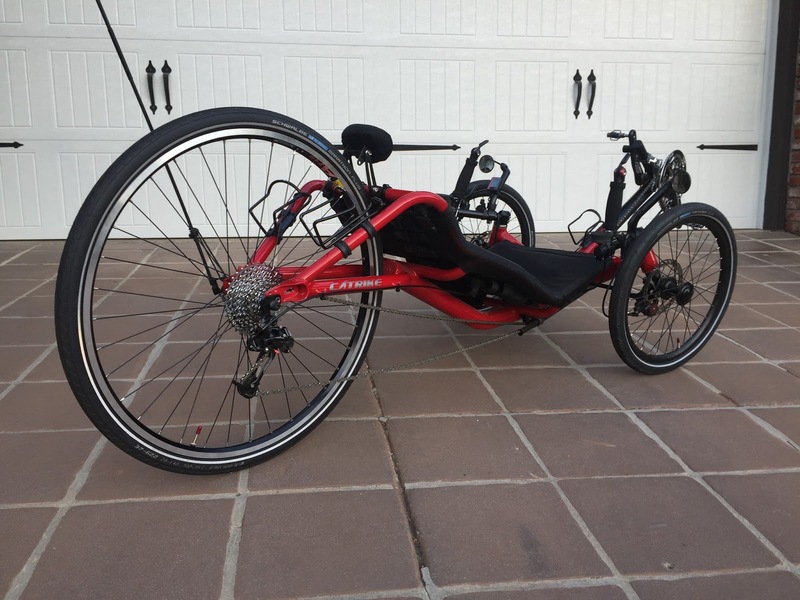 It's much easier to change tires then to have to maintain a second trike. With the tires I use it takes less then 8 minutes to change a tire and have it back on the trike. 7 - As mentioned in a previous post, adding a rack and panniers takes less then 7 minutes. 8 - If I decide to go with fenders (which I usually don't like) it takes no more then 10 minutes to set up fenders on all three wheels. 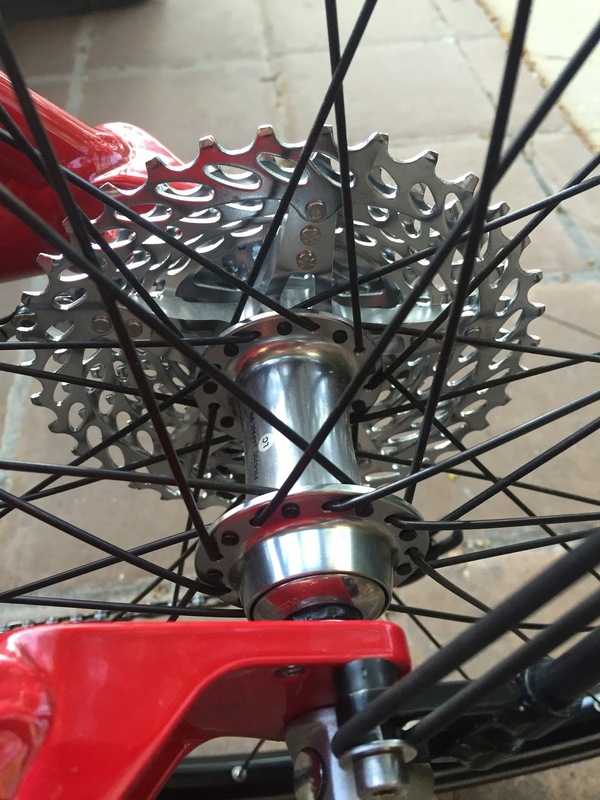 My fastest configuration for is the 28/622-American Classic wheelset on the rear with 23/406s up front and minimal carry alongs. At the other extreme is a configuration with a 40/622 Schwalbe Marathon Racer/DT Swiss wheelset on the rear and 40/402 Schwalbe Trekkers up front and a rear rack with panniers. I hope to try this combination out on maintained gravel and dirt trails in the future. In between these two extremes the best compromise between speed and comfort is the 35/622 Schwalbe Kojak/DT Swiss wheelset on the rear with 23/406 Schwalbe Ones on the front. By utilizing my two complete wheelsets, with tires already installed, I can go from light and fast to loaded in less then 7 minutes. Opted for the DT Swiss/Kojak wheelset for a softer ride today in the hills.The ride was spent meandering through neighborhoods an avoiding the load main roads. Here's a good reason why I'll be selling one of my Catrike 700s. 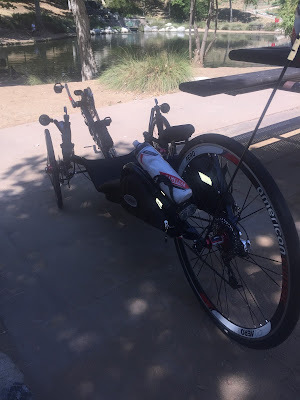 Although I set up my Red Catrike 700 for cruising and touring it still can't get me off the pavement. So what happens after I sell Red? 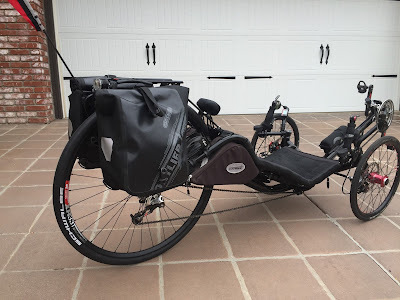 I'll be looking at fully suspended trikes that can comfortably handle gravel and dirt trails. My doing so I'll have the best of both worlds. 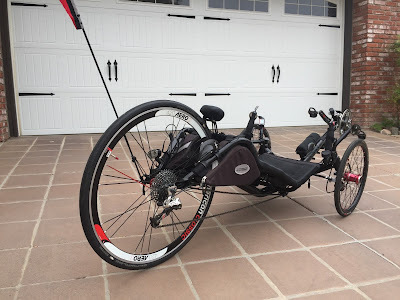 My fast 700 for paved streets and hopefully soon a suspended trike that will take me off the road and to places like the Bizz Johnson trail. What to do when you discover that you left your water bottles at home on a hot day? Call for backup. Carrie delivers my water bottles. Excellent service...thanks babe. Two things are certain for me (other then death and taxes), I will wake up sore and stiff every morning and my bulbous nose will begin to fry within minutes without sunscreen. I am cursed, like so many others of European ancestry, with white skin that does not like being in the sun. Non-the-less I like being in the sun and therefore I must rely on a good sunscreen that will protect my poor fragile epidermis without killing me with toxic ingredients. 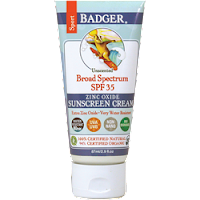 I have used many sunscreens over the years in an effort not to be lectured by my skin doctor on the dangers of being in the sun unprotected. For many years now I have used products with Zinc Oxide. Todays non-nano Zinc Oxide goes on thick but rubs in well with minimal "whiteface". Of all the Zinc Oxide based sunscreens, I've found Badger sunscreens the easiest to use and most effective and it's safe. They're line up of sunscreens don't clump with age. I use the Skin Deep APP for ratings on product safety. One final note. When using Zinc Oxide sunscreens I find buzzing or shaving wherever sunscreen is applied sure makes blending the white goo in easier. When riding an average of, at least, three times a week applying sunscreen can become a bit tedious, so shave them legs, arms and whatever else you like to expose. Forget the tan, a little "whiteface" is the true sign of an real outdoors person...right??? The marine layer gave way to some warm temps and humanity. As of 6/24 - For Sale at Bent Up Cycles in Burbank, CA. Restored to factory specs with following upgrades. Sram X9 - 10 speed rear derailleur. Original information posted below. Now outdated. I've come to the realization that I only need one Catrike 700. 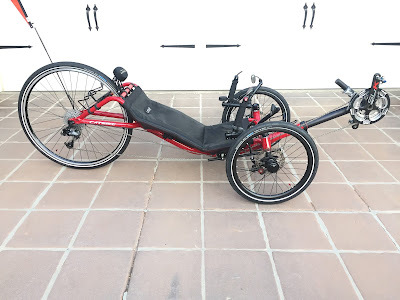 So here's my Red Catrike 700, bought new July 2014 with the redesigned Catrike spindles. It has only 220 miles logged. It is set up for comfort and durability with Schwable Tryker tires (or 35/406 Kojaks) in front and a Mavic 36 hole rim and a Schwalbe Marathon Plus 37/622 tire in the rear. No shipping. Local pickup only, Agoura Hills, CA (Between Los Angeles and Ventura). 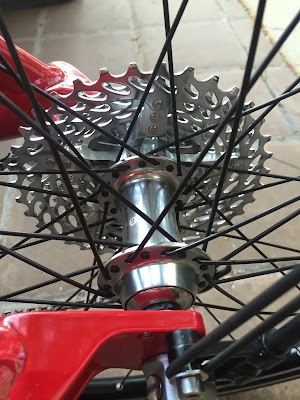 Top chain removed. 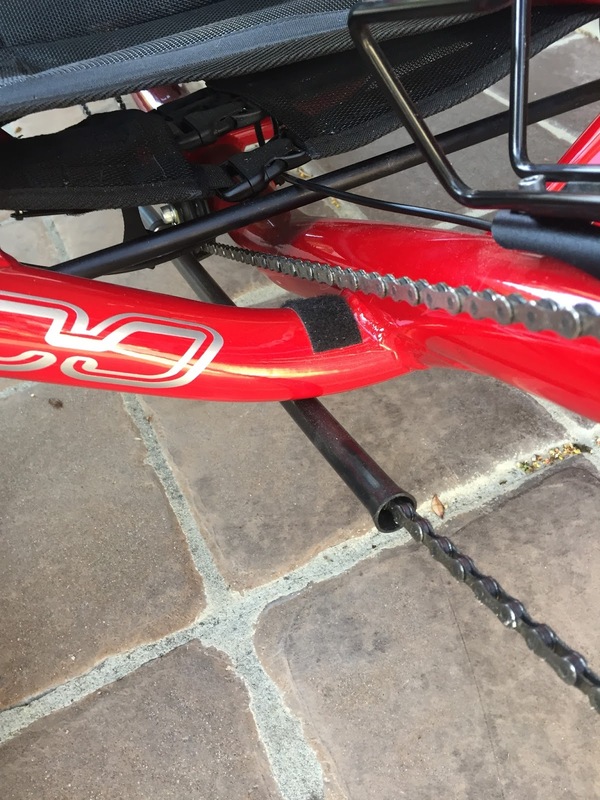 I have top tube and hardware if you want to replace it. Leave a comment if you're interested or see the Bent Rider classified add. It's been my desire for some time now to do a bit of touring on the ole trike. BUT...the one thing that is holding me back is I love hanging with family. Over the last few years I've made it a point that any vacations we take include throwing my trike on top of the car (or in the car) so I can take a ride during the day. When I'm done riding I'm back with my favorite people. 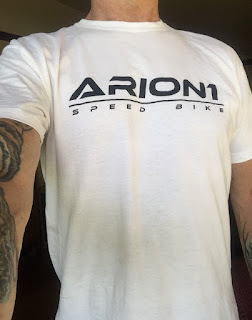 I've come to recognize that I get the best of both worlds by being able to ride new roads and trails and at the end of day be with my wife and kids while on vacation. Now with Byron living away and attending college and Leili studying ballet with various ballet companies it's pretty much down to taking trips with my best bud, my wife Carrie. As I dive deeper into retirement I'm starting to plan more "Day Tripping" vacations. A "Day Trip" vacation is simply driving to places that I want to explore on my trike and is also fun for Carrie (who prefers to explore on two feet). And maybe an occasional meet up with one or both of the kids. Light duty to heavy duty in under 7 minutes and back again in less then 5 minutes. Riding the Central Coast on my old Expedition. A perfect day of riding that ends with a perfect day of swimming with the kids and shared beers with Carrie. The old Expedition loaded on the car and ready to take off. Making good use of the 700 when the ride is over for the day. 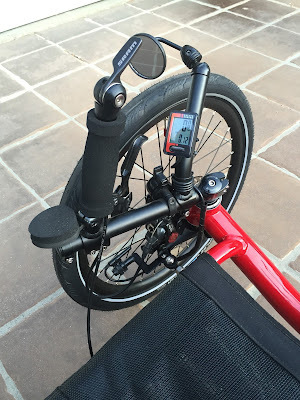 I've been using Crank Bros Eggbeater pedals since I started triking back in 2009. They're considered a MTB pedal but suit recumbent riding. After getting my new hips in late 2013 I've been steadily increasing my strength and riding faster. I've become uncomfortable with the excess float (ability to move foot from side to side while clipped in the pedal) of the Eggbeaters. 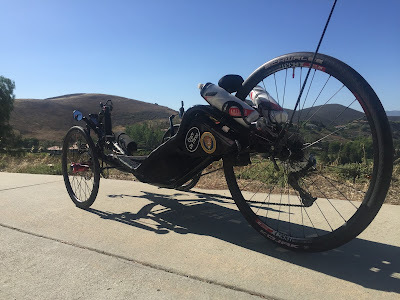 During fast descents on rough roads my feet will bounce around and sometimes my ankle will hit the crank. 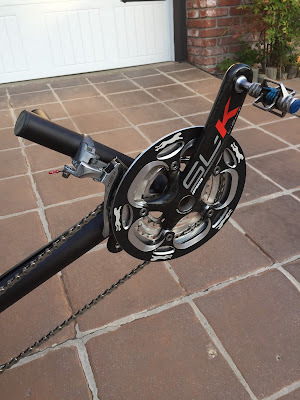 The Q factor (see Sheldon Brown Glossary for Q factor) on my crankset is 157mm which brings my feet close to the crank. Generally speaking, when clipped in, my feet feel a little to loose for comfort. In addition I fear that if my feet get bounced around enough they may become unclipped at high speed. I live in a hilly area where the roads are wide and invite you to keep your hands off the brakes. I routinely get into the high 30mph range and often into the high 40mph range. Occasionally I'll take a route that gets me up to 50mph and I don't want my feet bouncing around in the pedals. Recently I replaced the Eggbeaters with Shimano PD-6800 Ultegra pedals. Through choice of cleats the float can be adjusted from 6 degree float to 0 degree float. The spring tension on the pedals can be adjusted making it harder or easier to unclip from the pedals. 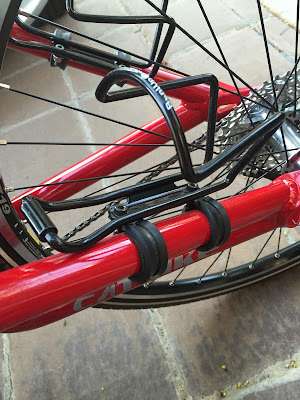 Being a triker and having no need to unclip at stops I can adjust the tension to keep my feet solidly in place. The cleats come in a yellow coded version with 6 degree float and red with 0 degree float. The color sections on the cleat not only indicate the degree of float but also serve as walking platforms when off the trike. With the change in pedals I had to purchase new road shoes to accommodate these road specific pedals. Luckily Bontrager makes a road version of the RL MTB shoe I was using, the RL Road. Bontrager is the most comfortable cycling shoe I have ever worn and I managed to find last year's model (with the silver ratchet lever) in my size at a reduced price. I'm enjoying the Shimano PDs. My feet truly feel like a part of my trike now. No more bouncing feet on rough roads. Right now I'm using the Yellow 6 degree float cleats. The 6 degree limit on float protects my feet from banging the crank. I may try the 0 degree float cleats later on. 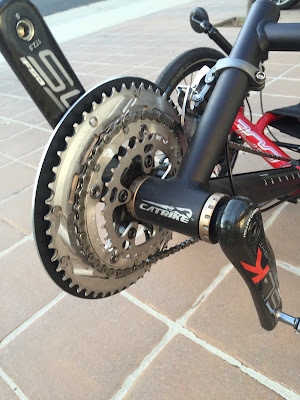 Note; If you're using a Schlumpf crank you probably won't be able to hit the shift button with these pedals. Yellow 6 degree float cleat. 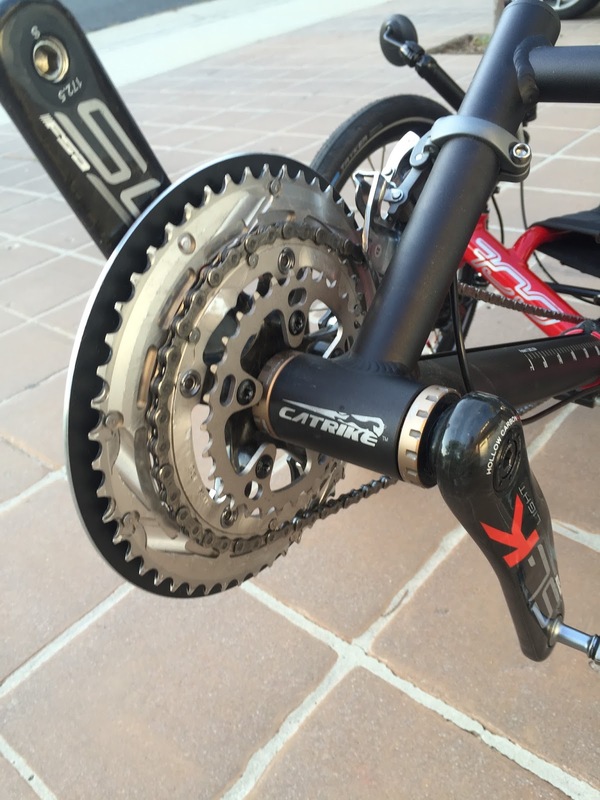 The Shimano cleat has a wide platform. The yellow tabs on the side of the cleat serve only to add more stability when walking. 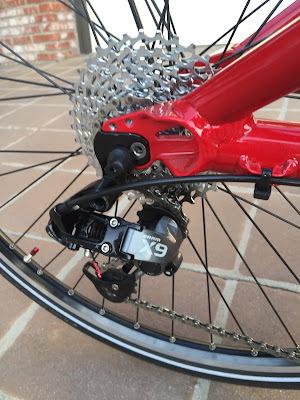 Thus the reason I choice Shimano over similar pedals from other manufacturers. With the added Kool Kover (picture below) walking is reasonably comfortable. Kool Kover cleat cover. Prevents cleat wear from walking. Also more stable non-slip platform when walking. Bontrager RL Road shoe with cleat. Red 0% float cleat. Note the larger rounded area on top of the cleat compared to the yellow cleat. This is what keeps the float down to 0 degree. My old Eggbeater pedal. A good pedal but not right for the way I ride. Throwback Thursday - Trying Out Two Wheels. Back in July of 2010 I bought a Bacchetta. Didn't last long. I love trike'n.